MAGNUM CAPACITORS are heavy duty and the construction is burst-proof which are characterized by their high resistance to insulation and lowest watt loss in its class. · Ambient operating temperature range. · Very low dissipation factor. · High performance metalized polypropylene film. 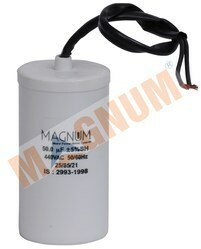 Magnum run capacitors are designed for continuous duty, and they are energized the entire time the motor is running. • Ambient operating temperature range. • Very low dissipation factor. • High performance metalized polypropylene film. Magnum start capacitors briefly increase motor starting torque and allow a motor to be cycled on and off rapidly. High performance metalized polypropylene film.